Yesterday, Jay Baer of Convince and Convert wrote a very interesting post: “Are Social Media Jobs About to Disappear?” Like all posts I find are great, it got me thinking – and while I respectfully disagree, I’m glad I got to read it. It got me thinking about the future of social media in a corporate world. In his post, Jay claims that social media will become integrated into the corporate world. Everyone is active in social media anyway so that it will be integrated into any process the company implements. The marketing department will integrate it into their marketing activities; customer support will integrate it into customer support, sales into sales, and so on. While I disagree with this generalization on a lot of levels, I do also believe Jay is right. I won’t deny that social media is changing, especially on a corporate level. As new ways of using social media for corporate goals and processes are being integrated all the time, they are being integrated into the related departments. Social media is changing, especially on a corporate level. Jay is right, the era of the Social Media Department as the singular user of the social media toolset and communication form is ending and probably never should have existed in the first place. The Social Media Department that Jay talks about only ever existed because corporates didn’t understand social. So they created a department that consisted of people who they thought would understand it and make good use of it. More often than not, that went wrong anyway. Jay is also right that the traditional Social Media Manager role is going to disappear – because, with the growing complexity of communication on Social Media, the role will dissipate in the general communications within the different departments. Sales simply has different Social Media communication needs than customer support. Let’s conclude this part with noting that the traditional Social Media department will lose its relevance within the Social Media AND corporate world of tomorrow. As I said above, the Social Media Department that Jay talks about probably shouldn’t have existed in the first place. Because it was born out of a huge underestimation of the complexity of Social Media. The current social media department was born out of a huge underestimation of the complexity of Social Media. When that department was created, the executives saw social media as a new form of communication where they could be active (and some of them even saw the actual need to be active). What they failed to see was that Social Media was going to change every little aspect of their corporate world. Because Social Media changed everything. Sales can now communicate with prospects without becoming the annoying guy that calls weekly. Marketing can generate leads without sending promotional messages. Customer support can communicate and help customers after they send a single tweet. And all these processes can even be joined: Employees become brand advocates while customers become referrers. That’s a Social Business – but creating a Social Business is not as easy as it appears to be in Jay’s original post. Creating a Social Business is not as easy as it appears to be. A Social Business needs vision and visions need to be defined. A Social Business also needs to adapt constantly to the changing landscape, integrating new mutations into its activity and unifying the social approach of the whole company. New opportunities need to be identified all the time. What Jay seems to ignore in his post is the fact that Social Media has not slowed in its development and even growth (although I can see that US companies might think so). You can still see rapid changes in Social Media and new strategies in Social Media still appear every day. Leaving this to the responsibility of the department at hand means ignoring the opportunity. 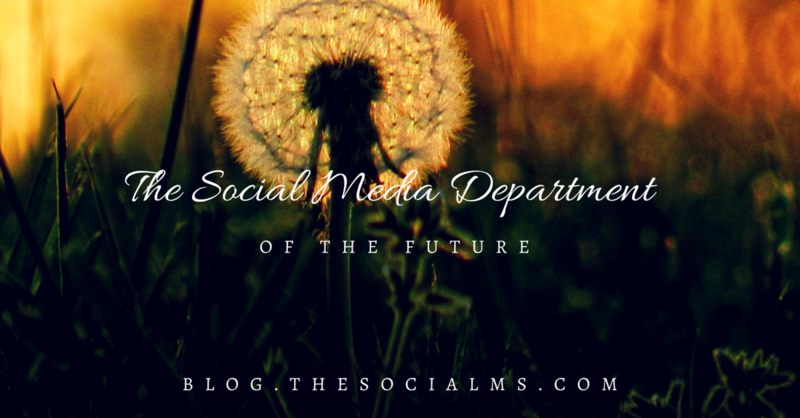 The Social Media Department of the future is the department where all of the above is linked together. Jay does note in his original post that there needs to be a top-level executive role in some way to oversee and organize the implementation of Social Media. Where I disagree with this is that I see a department that has a much deeper role in the company. And I don’t see it as a top layer that oversees this. The Social Media Department of the future should not just have organizational responsibilities. It should be a place where opportunities are explored. Currently, a lot of this is outsourced to consulting companies. This does make sense a lot of the time, but it is my strong belief that this is not enough. Social Businesses need to breathe social. They need to explore the areas of Social Media that fit their company, need to identify their own social DNA. Consultants can only go so far with this and a singular strategic direction identified in a consulting project over the course of a couple of months won’t suffice. 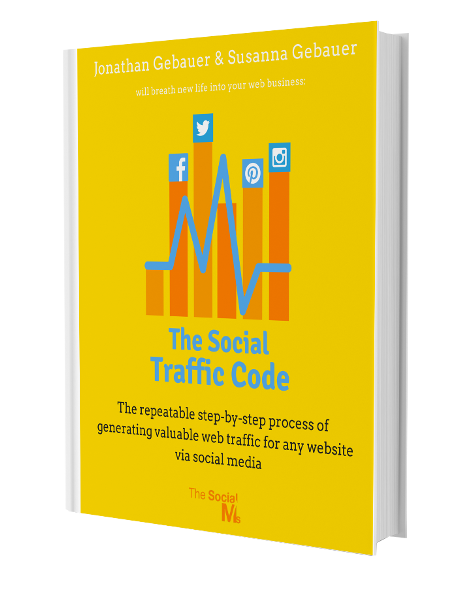 If you are still a far way from having a social media department check out our ebook “The Social Traffic Code” – we teach you the step-by-step process to social media growth. Jay Baer’s claim is that Social Media jobs will dissipate with the integration of Social Media in the corporate world. But the Social Media jobs he is talking about are a thing of the past anyway. That doesn’t mean the Social Media Department itself will vanish. It just won’t be (just) a communication department anymore. There will be a time when Social Media will slow down, where other areas of business develop faster and are more relevant. Where what Jay states will become the truth. But that time is not 2015. And probably not going to arrive in the next 10 years. 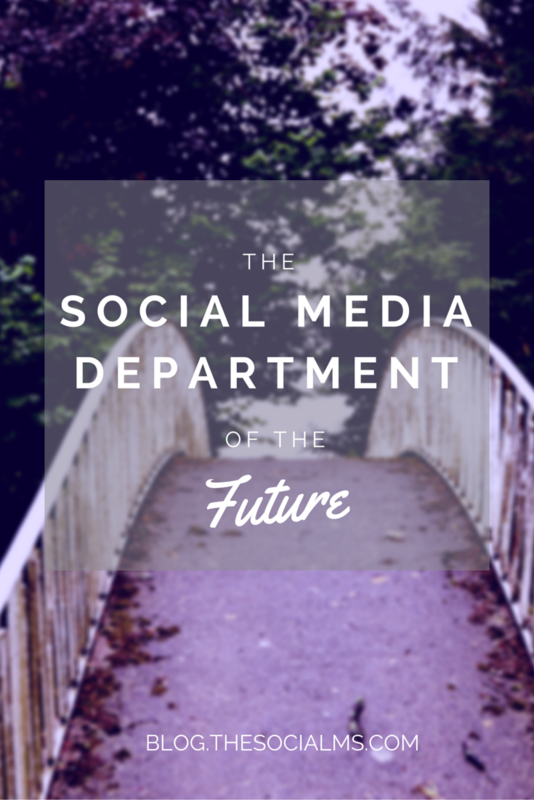 The Social Media Department of the Future is a Think-Tank, not a communication department.